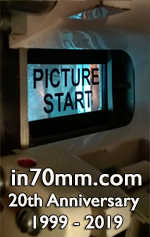 As I have three summers in a row, I traveled from Philadelphia to Washington DC for daytrips to enjoy the summer's “70mm Spectacular” at the AFI Silver Theatre as there's no 70mm projection remaining in Philadelphia. From DC's Union Station, the AFI Silver is a short ride away on the Metro's Red Line, followed by a brief walk. The Silver was designed in the Sreamlined Moderne style of Art Deco by architect John Eberson in 1938, to resemble a cruise ship. 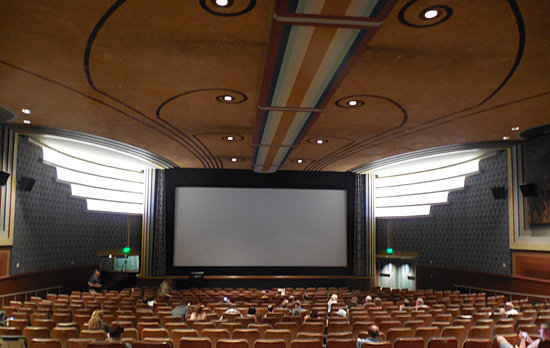 It closed in 1985 and was in danger of being demolished, but local citizens waged a long fight to save it, and with support due to the suburban town's quest for it to anchor downtown revitalization, it reopened with in 2003 with management of the American Film Institute. 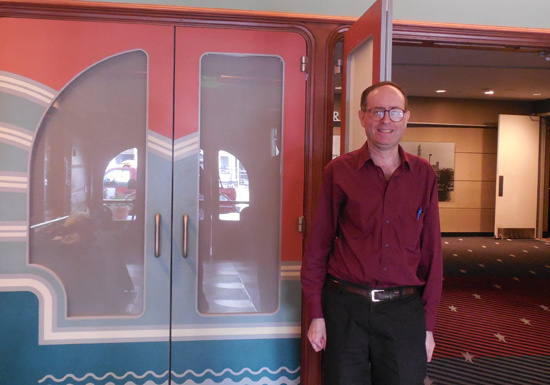 The historic lobby and auditorium were beautifully repainted with 40 of the original 1930s Streamlined Moderne colors. 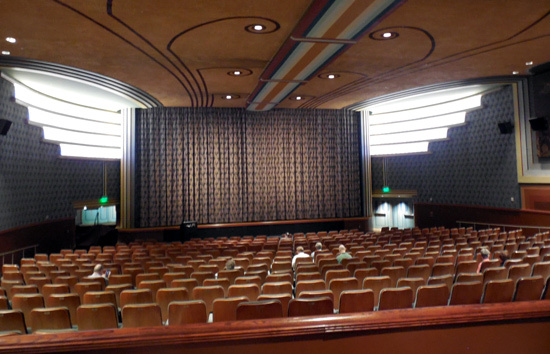 The historic auditorium was restored though partly altered to accommodate a larger screen, which is curtained, flat, and 41 feet wide and 18 feet tall. This auditorium now has 400 seats. Two newer auditoriums were added next door, with a common foyer, but the newer auditoriums don't have 70mm projectors. The theater's marquee has a wraparound digital display. Many movies, classic and new art films, are shown daily, so many movie titles circulate daily on the marquee. To photo the marquee showing the movie that I'm seeing, I cross the street, and with the busy traffic, especially buses getting in the way of photos, it takes awhile to wait for the movie title to appear and to not have a bus or cars dominate the photo. 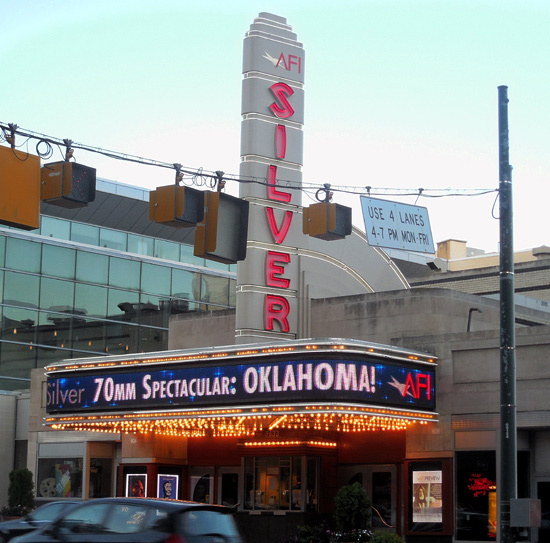 On Sunday, August 24 at 1:15 PM, I found myself in the historic auditorium of the AFI Silver, at the “70mm Spectacular, Part 3” watching the first ever Todd-AO movie, Oklahoma! (1955, 2.2 aspect ratio). This screening was from the new DCP restoration, made from the 65mm negative. The film, especially its colors, looked gorgeous, really phenomenal. The scenery and costumes looked great. As wonderful as it looked, no 4k DCP has the resolution of 70mm. 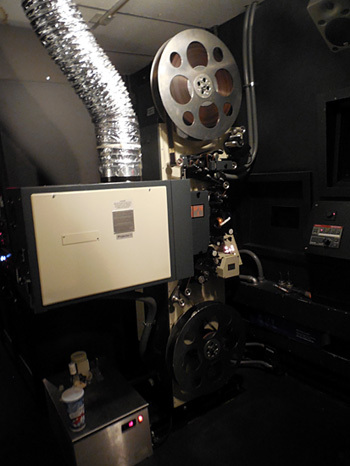 The original 6 track (5 tracks of sound behind the screen, one surround) was used for the restoration, but changed into 5.1 DTS (3 tracks behind the screen, two surround, and the .1 being the subwoofer). I did not detect any surround sound. Another member of the audience told me there is little surround sound on the Blu-Ray. Two summer's ago at the first “70mm Spectacular” I had enjoyed another musical, South Pacific (1958, 2.2 aspect ratio) which was screened in 70mm and displayed far more detailed resolution, truly requisite details. At last summer's “70mm Spectacular, Part 2” I enjoyed the DCP restored Hello, Dolly!” (1969, the DCP shown in 2.39 aspect ratio) another digitally restored musical that looked wonderful on the big screen. After Oklahoma! I watched the next film in the historic auditorium, starting at 4:20 PM, an excellent 35mm print of “Cromwell” (1970) which had been a blow up to 70mm back in the day. “Cromwell” was one of more than two dozen films in a Alec Guinness Centennial series including the DCP of Lawrence of Arabia (1962, the 70mm original is frequently shown, too), the DCP of The Bridge on the River Kwai (1957), and a 35mm print with DTS sound of Doctor Zhivago (1965) Half a dozen additional series of classic films were listed in the July thru mid September brochure including a series on Cinema and the Great War which featured talkies, but also included silents using the historic auditorium's digital pipe organ that distributes surround sound. On Friday, August 29, the day before the three day Labor Day holiday weekend, I enjoyed 2 movies, each from a vintage 70mm print from a Swedish archive, with Swedish subtitles. The subtitles on each film were not huge and were not distracting. Both movies were roadshow versions in 2.2 aspect ratio and with 6 track sound on the film. The curtain was used with finesse for both movies, as it was closed during the Overture and Intermission. With only fifteen minute separation between them, the first movie began at Noon and the second movie finished at five minutes before 7 PM. 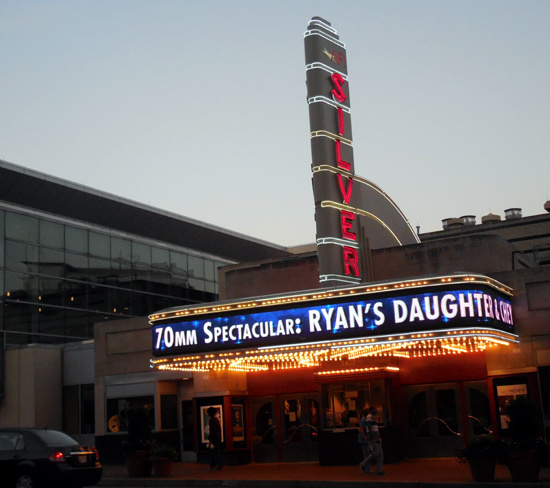 Film Cans with "Ryan's Daughter" (my favorite film experience of this year's festival). Ryan's Daughter (1970), directed by David Lean, was Friday's first movie, and though I had not seen it before, the print looked excellent. I had read accolades on the Internet from 70mm film fans about this movie and upon seeing the movie, understood the acclaim as it deserved its Oscars it won for Cinematography and acting, was very interesting and took advantage of its 70mm resolution for details. To my delight, Ryan's Daughter had surround sound, and during the storm scene, the surround sound fantastically filled the auditorium. The intermission title said “Paus” When it was originally released, Ryan's Daughter was perceived as a box office disappointment even though it was the seventh best box office performer of its year. People had expected an epic film from David Lean such as Lawrence of Arabia or Doctor Zhivago (which adjusted for inflation, is still the eighth most successful film of all time at the box office). In my home city of Philadelphia, it was not shown in a major movie palace downtown but instead was shown in the Trans-Lux. Ryan's Daughter is a different kind of movie, but it is a real gem and was truly awesome to enjoy in this 70mm print. Friday's second movie, at 4 PM, was John Ford's last Western, Cheyenne Autumn (1964). The print had various glitches, but was watchable and a joy to see it in 70mm resolution on the big screen. I did not detect surround sound. The movie, with its all star cast, was beautifully filmed in many locations in the West in the States. As it is a film about the brutal way that the government treated American Indians and the heroism displayed by the Cheyenne, it was not very successful at the box office when it was originally released. It was also not originally shown in a major movie palace in downtown Philadelphia, but instead was shown at the Stanton. Both Ryan's Daughter and Cheyenne Autumn have war scenes but weren't the first films involving war that I saw at the AFI Silver. Two years ago, in the 1st 70mm festival at the AFI Silver, I enjoyed the newer 70mm print of Khartoum (1966) projected in the 2.76 aspect ratio. Last summer, in the 2nd 70mm festival at the AFI Silver, I enjoyed the newer 70 mm print of Patton (1970). Kinoton FP 75 E projector with "Around the World in 80 Days" reel before movie started. On Sunday, August 31, I saw Around the World in 80 Days (1956), the second film made in Todd-AO. This was the only film of this festival that I had seen, long ago on a TV, a tube TV with 1.33 ratio so I had not seen all of the film. In downtown Philadelphia “80 Days” had originally been shown for a fifteen month run at the Midtown which showed many of the 70mm epics in the 1950s and 1960s. “80 Days” started screening at the Midtown in the end of 1956, a couple days after a belated 4 month screening ended at the Midtown of Oklahoma! The fading ad for 80 Days is still on the Midtown's back wall. 80 Days had won 5 Academy Awards including Best Picture so I was really keen to see it on the big screen. Sadly, though the 80 Days print was projected from a 70mm print and 30 frames per second, almost all the film was faded to magenta and white with brief glimpses of other colors, including yellow and green for details. he AFI Silver box office staff courteously told everyone purchasing tickets that a full refund would be provided if people preferred to depart the screening. Nobody or almost nobody departed. Shown was a print from the 1968 release, so there were also scenes including much of the prologue that had been edited away. The sound was 6 track on the film, and was terrific including loud surround sound, especially of trains and of the jungle in India. There was no Overture. There was music to end the Intermission and there was exit music. The closing credits were fantastic and much or all of the closing credits were not faded. This immensely fun film drew applause from the audience including me, but it was so faded to pink I don't believe I've seen it on the big screen anymore than if I saw a painting in an art museum with most of its original colors gone. Thankfully, most of the films at the three annual 70mm festivals have been in excellent shape. If 80 Days can't be restored with a 70mm print, then a splendid DCP restoration would be most welcome, such as accomplished with Oklahoma!. 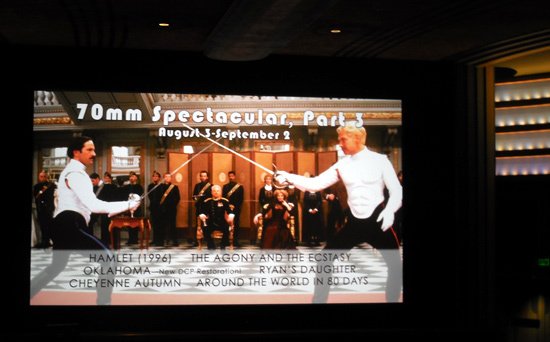 I did not travel to DC on Sunday afternoon August 3 for the 70mm screening of the first film of the festival, "Hamlet" (1996) as I had seen it at the Paris in New York City in 70mm when originally released. The second film of the festival was The Agony and the Ecstasy (1965) shown in 70mm one time each Saturday August 16 and Sunday August 17. I had looked forward to seeing that film about Michelangelo painting the Sistine Chapel ceiling, but was unable to attend. 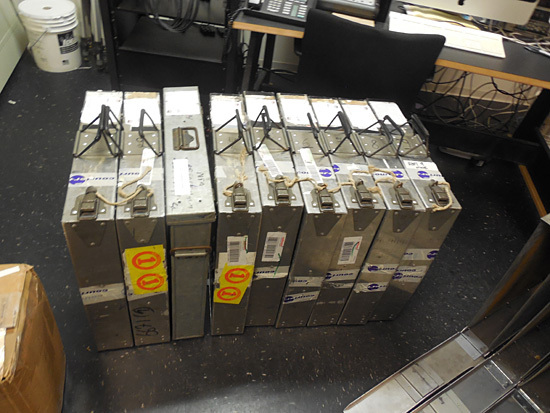 Part 3 of the 70 mm festival had only six titles which is fewer movies than Part II, which had the nine titles, counting the DCP restorations of "Cleopatra" and "Hello, Dolly!". Each year, fewer movies have been shown. The first festival, in 2012, had a dozen titles. There are 70mm classics that have been shown in recent years in other cities but not yet shown at the AFI Silver, so I hope there is a 70mm Spectacular Part 4 next summer! 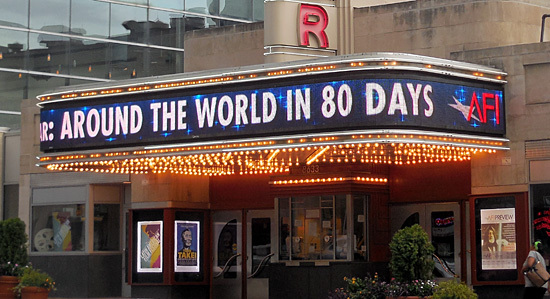 "Around the World in 80 Days" on the marquee.